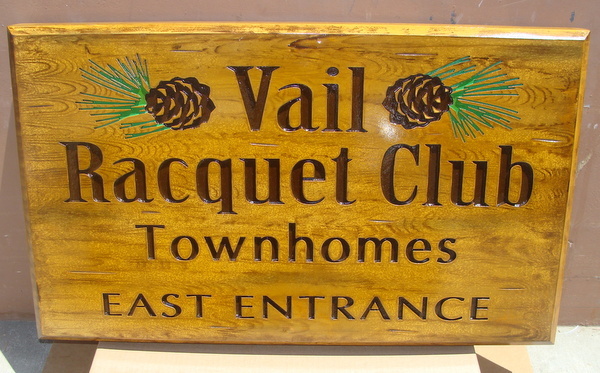 This beautiful and interesting engraved entrance sign to a townhome development "Vail Raquet Club", looks like naturally finished wood, but is actually hand-carved from 30 lb/ft HDU. The customer wanted a sign that looked like wood but had the longevity of HDU. The wood grain markings and pinecones were hand-carved with a chisel, the text with our CNC router. After painting, the entire sign was clear-coated twice to protect against the weather and UV radiation. The sign can be mounted on a gate, a wall, on a post or between two posts, or hung from a wood or iron hanger from eye-hooks on the top of the sign.